iOS 7 has finally been released today, and with it the first set of apps updated for the new version of the platform. Among them is a major new release of UX Write, which addresses language support, and adds several important new editing features. 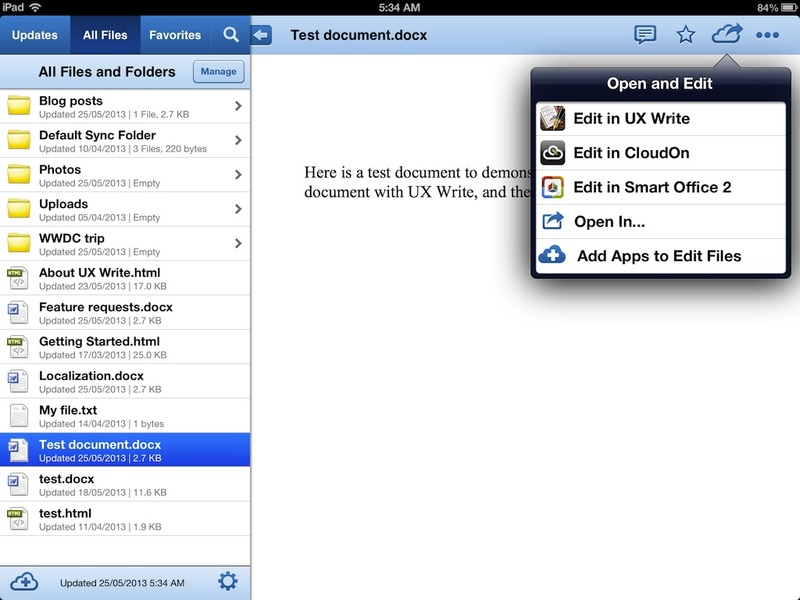 UX Write 1.2 requires iOS 7, and will run on the iPad 2 or later, iPad mini, and iPhone 4 or later. All menus, dialog boxes, and other user interface text have now been translated into the following languages: Chinese (Simplified/Traditional), Dutch, French, German, Italian, Japanese, Korean, Portuguese (Brazil/Portugal), Russian, Spanish, and Thai. 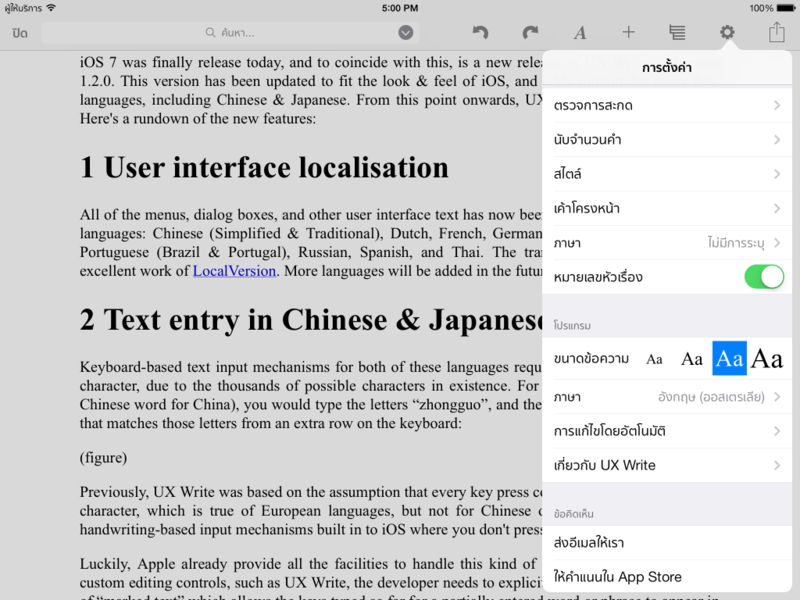 The translations are thanks to the excellent work of LocalVersion. More languages will be added in the future. Keyboard-based text input mechanisms for east-asian languages require multiple key presses per character, due to the existence of many thousands of possible characters. 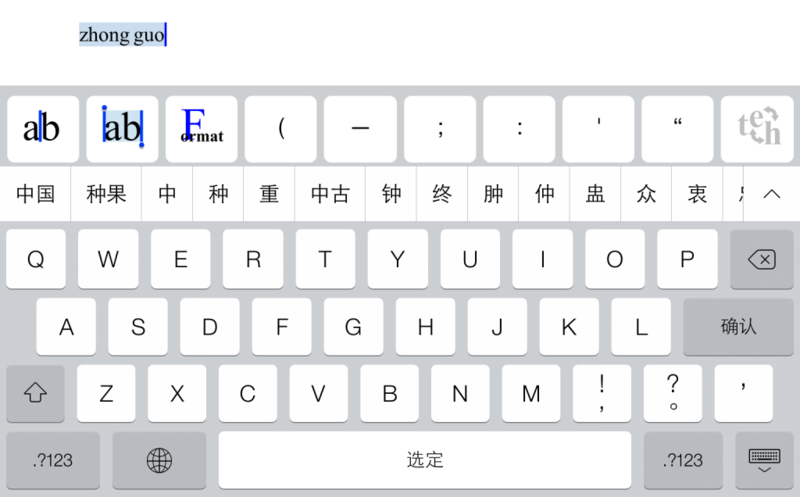 For example, to type 中国 (the Chinese word for China), you would type the letters “zhongguo”, and then select from a list of candidate words from an extra row on the keyboard. Previously, UX Write operated under the assumption that every key press corresponded to an individual character, which is true of European languages, but not of Chinese or Japanese. There are also handwriting-based input mechanisms for these languages built in to iOS where you don’t press keys at all. Luckily, Apple already provide all of the keyboard logic for taking this kind of input from the user, including the word choice mechanism described above. However, apps like UX Write which use custom text editing components have to explicitly cooperate with this logic by supporting so-called “marked text”, which is the sequence of letters that has been typed by the user, but is “provisional” in the sense that it will later become a different sequence of characters when you finally choose a word. It was this relatively small piece logic that UX Write was missing, and now that I’ve added support for this, the key-based and handwriting-based input mechanisms for Chinese and Japanese now work. You wanted it, you’ve got it. This has been the most requested feature of all over the past few months, and is finally in. You know that empty space at the top of the toolbar where other apps put direct formatting properties like font size and paragraph alignment that really belong in styles? I’ve used that space instead for a search bar — just like you have in Safari. Just tap on it and type in your search term. On the iPhone, it is accessible under the Settings menu. Regular expressions, if you haven’t encountered them before, are a way of specifying patterns of text that you want to match, rather than an exact match of a particular word or phrase. UX Write supports regular expressions in both the search text and the replacement text. If you’re an old-school Unix hacker you’ll be familiar with the concept; otherwise, you can learn about them here. UX Write’s regular expression support uses the NSRegularExpression class that is part of iOS; you can see the details in all their glory on Apple’s developer site. One suggestion a beta tester made to me was offering a “whole words only” option for find & replace. I’ll be providing this in a future update. Another often-requested feature, this is now available as well. You can access it from the Settings menu, and it will highlight any words it finds that aren’t in the dictionary. The user interface for correcting a word is the same as what you use for autocorrect — you can select from a list of alternatives, or add it to the custom dictionary (which can also be edited through the Settings menu). One caveat with spell checking in UX Write is that it only works with languages for which Apple provides a built-in dictionary. These languages are: Danish, Dutch, English, French, German, Italian, Portuguese, Russian, Spanish, and Swedish. If Apple later start including dictionaries for other languages, then these will be automatically supported for spell checking and autocorrect purposes by UX Write. There’s not really much to say about this I guess other than yep, it’s there. I did find out however rather late in the piece that Japanese is written without spaces between words, and I’ve been told that in Chinese spaces are often omitted as well. Thai is the same; I’m actually studying Thai at the moment and while the books we’re using in class use spaces between words to help us comprehend sentences more easily, this is not done for mainstream Thai writing. So for now at least, word count only works properly for languages in which words are separated by spaces. However, it does also show the total number of characters and paragraphs in the document as well, so if either of those is what you’re after, you can get them as well. I’ll be adding an extra item for character count excluding spaces in a future update. The release of iOS 7 is one of the most significant in the platform’s history, after the introduction of third-party apps in 2008, and multitasking in 2010. While on the outside there’s a complete visual refresh, there’s also a lot of new features “under the hood” that I’ll be taking advantage of in future versions of UX Write. One of those in particular is real-time pagination in WebKit, which will allow me to provide an option in UX Write that will show you where page breaks will occur in the printed document. A lot of people coming from an MS Word background have been asking for this, but I haven’t been able to provide it to date due to limitations in WebKit. Unfortunately, the pagination support in the initial release of iOS 7 doesn’t work correctly, so I have to wait for Apple to fix the bugs I’ve reported before I can make use of it in UX Write. Other new features I plan to utilise include improved background file transfer, AirDrop support, and CSS regions (enabling magazine-style page layout). I’ve really only scratched the surface of what iOS 7 has to offer at this stage, because all the beta versions of 1.2 had to be compatible with iOS 6 as very few of my beta testers have developer accounts. Now that iOS 7 is available to the public however, new releases of UX Write from now onwards will depend on it. While I’ve been reluctant to drop support for older versions — particularly because iOS 7 won’t run on the original iPad — I’ve concluded that the effort required to support both is too much to be worth it, and I’m better off putting my time into adding new features. If you have an iPad 2 or later (including iPad mini), or an iPhone 4 or later, you can update to iOS 7 for free. When opening an existing Word document that doesn’t already contain heading styles, these will not show up in the formatting menu. If you encounter this problem, open up the document in Word, mark one or more paragraphs using the heading styles you want, and then take the document back to UX Write. The external keyboard is not recognised in some cases. If this happens, just tap on the screen and this should get it to recognise the keyboard. The replace field doesn’t work on the iPad. Currently there’s no workaround for this; it only works on the iPhone. Yes, this is a bit embarrassing. I’ve already fixed all three of these bugs (plus a few others) and submitted a 1.2.1 update to Apple. It should be approved for release in the next few days. Do let me know if you find any other problems. Update (19 September): Apple approved the 1.2.1 update in just over 24 hours. Normally it takes 4-5 days; I’m impressed! 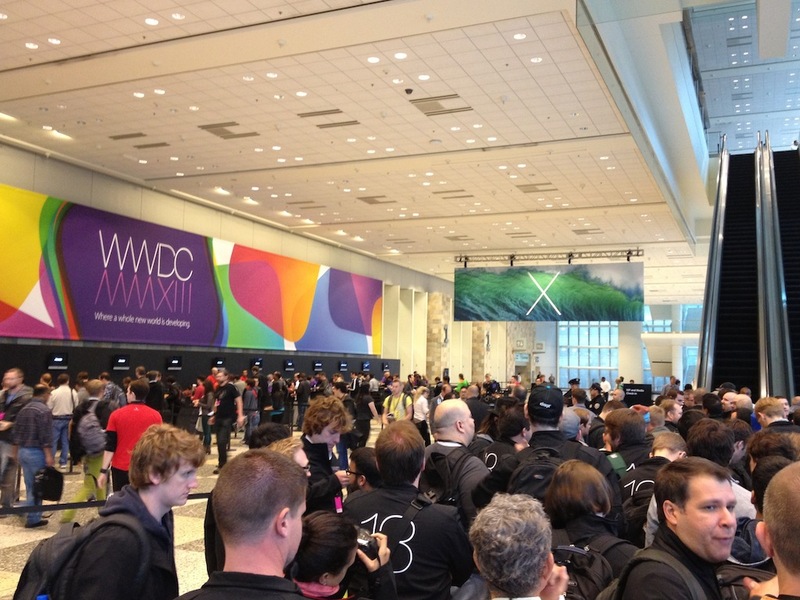 It’s been a pretty amazing week for me here in San Francisco, attending WWDC 2013. This is my first time at the conference (and my first time in San Francisco, or the US for that matter), and I’ve really had an incredible time meeting some great people and experiencing some of the energy here. There were basically two main parts to the conference – sessions on new features in iOS 7 and OS X Mavericks, and the labs in which developers have the opportunity to sit down with people from various engineering teams within Apple. 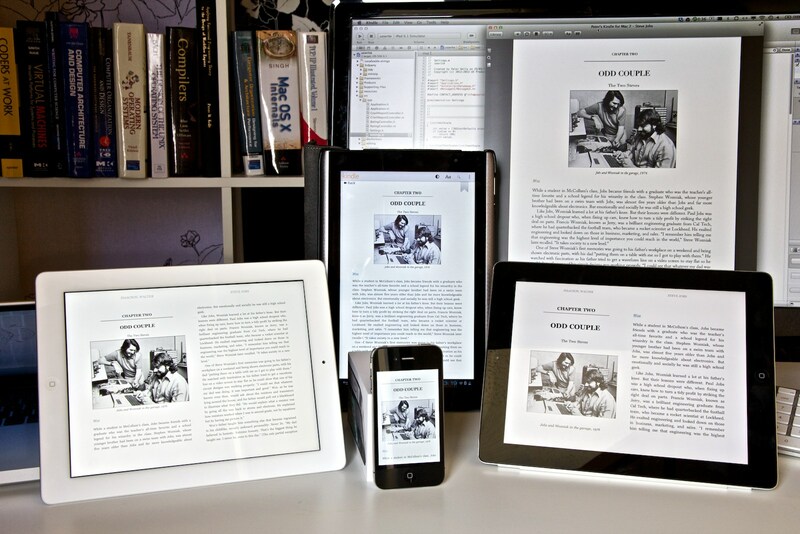 My primary focus of course was on WebKit, as this is main the part of iOS that UX Write is built on. I had the opportunity to talk with some of the team about new features that have been introduced, and work through a few issues I encountered – which has been extremely valuable. Much of what was covered during the conference is subject to a confidentiality agreement that all developers are required to comply with, so unfortunately I can’t give details about the new features other than what was discussed in the keynote. The session videos and all new documentation & SDKs are, however, available to all registered Apple developers (and, presumably, NSA contractors). What I will say is that there are some very exciting capabilities coming in iOS 7 that are going to enable me to provide certain features in UX Write that I haven’t previously been able to, and I’m very much looking forward to taking advantage of these. Once iOS 7 is out, all future updates to UX Write will depend on it, so at that point you’ll need to have it installed (iOS 7 will run on iPad 2 and later, as well as iPhone 4 and later). Take 5000 developers from all around the world, 1000 people from Apple, and put them together for a week, and it’s not hard to predict that there’s going to be a very large number of great conversations and exchange of ideas. This is where it all happens – it’s the center of the Apple universe. The success of the iPhone and iPad is as much due to third-party developers as it is due to Apple themselves. This is the only time of year where both get together on such a massive scale. And I don’t think I’ve ever seen so much aluminium in one place before. By far the best part of the conference was the labs held each day, where you could talk with engineers from various teams about any questions or issues you had about features of iOS that relate to your app. 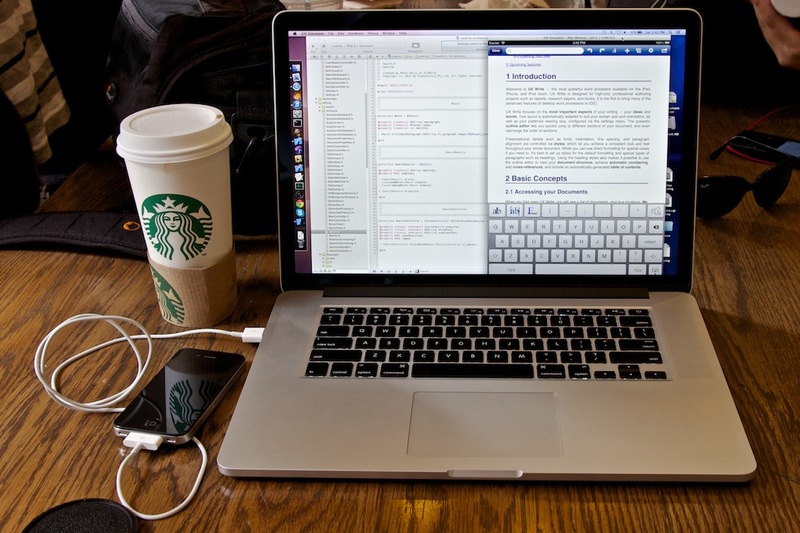 Most of my lab time was spent with the Xcode and WebKit teams. When you find a bug and are trying to track it down, it’s great to be able to get in touch with the person who works on that part of the OS and have them go into the debugger with your program, and say “ok, I think I can see what’s happening here. You can work around it for now by doing X, and I’ll put this in our bug tracking system”. I also had some questions about a new feature in WebKit that I’m going to be using, and it was incredibly valuable to sit down and get advice on best practice for using it directly from the people who implemented it. You simply can’t get that kind of thing anywhere else. It took a flight to the US, a meeting with two people from the app store team, and a very unambiguous demonstration of both the original and rip-off versions of UX Write (including the crash in the latter when you change the text colour, the “UX Write has crashed” screen, and the crash log that it sends to my email address) to convince them, but the problem has finally been dealt with. Now the only version of UX Write you can buy on the App Store is the one which is actually going to be updated with a ton of new features over the coming year and beyond. I’ve also made some suggestions about how these problems could be avoided in the future, using a very straightforward O(n log m) algorithm in which the hash of each of the n files in a new submission is checked against a database of hashes for each of the m files from every version of every app previously submitted. From there, it would be necessary to filter out known common, publicly-available files (such as resource files from SDKs and open source libraries), and then flagging any app with remaining matches for manual inspection. It would likely be necessary to throw a fair bit of hardware at this, but I can’t imagine it being particularly difficult to implement. I think they get it now, and I’m really hoping to see something along these lines put in place, because I think it’s very important for the credibility of the app store as a reliable and trustworthy marketplace for both app developers and customers. Half-way through WWDC, when you’ve spent the past day or two writing prototype code and test cases to discuss with engineers in the labs, is quite possibly the worst imaginable time to lose an SSD. In my particular case it was an OCZ Octane S2 drive that went, and I believe the failure came about due to either a firmware update I had to install on Monday night so I could upgrade to Mountain Lion, or a compatibility issue between Mountain Lion and the drive’s firmware itself. OCZ’s mac support is laughably bad. I could have gotten a replacement drive installed, but it looked like that was going to take a few days to organise – time that I simply didn’t have. The situation I was in meant I absolutely had to have a working machine to make the most out of my time in the labs, plus some meetings I have lined up with a number of companies next week. So I bit the bullet and decided to just walk a couple of blocks away to the Apple store and buy a new machine. I’m now the proud owner of a brand-new 2.8 Ghz quad-core retina Macbook Pro with 16Gb of RAM and 3/4 of a terabyte of (Apple-supported) SSD storage. It was a very expensive day to say the least, but my old laptop was about due for an upgrade anyway, and I’m very happy with the performance of the new machine. 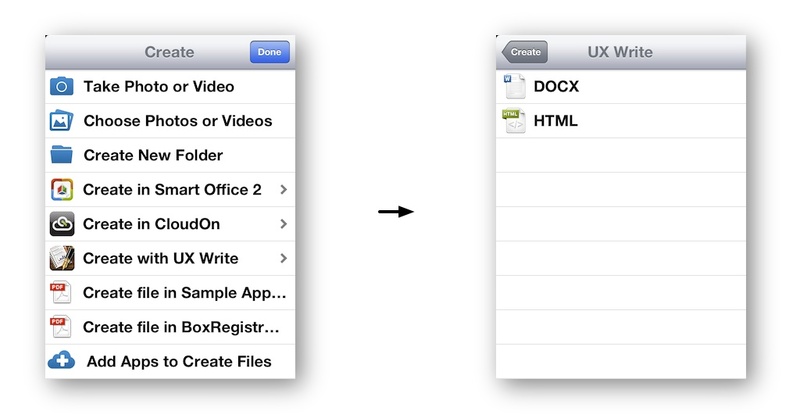 One of the things I want to do with UX Write in the future is to improve integration with other apps – in particular those which provide complimentary functionality, such as diagram editing (OmniGraffle), text manipulation (TextExpander), and online storage & collaboration (Box). It’s kind of difficult getting data between apps on iOS, since unlike on other platforms this requires explicit cooperation between app developers. 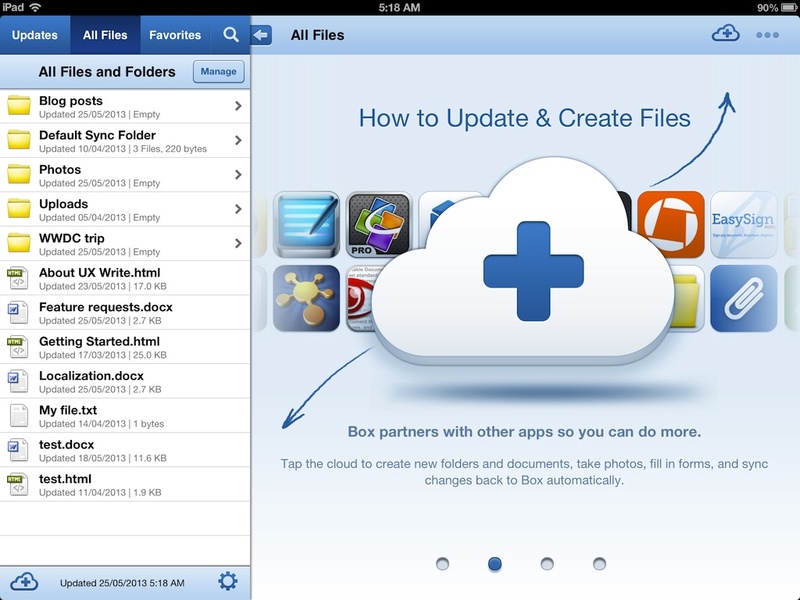 I’ve already been doing some of this with Box and Texpad, and met with people involved with both OmniGraffle and TextExpander and I hope to get some some integration happening with both of these great apps. I demoed the app to quite a few people, and had some really encouraging responses. Many were previously unaware of the app – building awareness has been perhaps the biggest challenge for me – but once they saw it they thought it was very cool. UX Write of course isn’t perfect yet (what software is? ), and there’s still a lot of work to be done on advanced features like change tracking, EPUB export, page layout, file management etc. So if you’ve had issues with these, I don’t want you to read the above paragraph as me thinking the app is “done” – it’s still very much a work in progress. But things are looking very good, and I’m feeling pretty confident about the future as I continue to work through my roadmap. This was one of the biggest pieces of news (or perhaps non-news) to hit iOS in a long time. After 5 years of it being possible to create third-party apps for the iPhone, Microsoft finally achieved the goal of bringing Office to the platform. I tried it out, and perhaps the most amazing thing about it is how spectacularly bad it is. I don’t usually criticise the competition, but I’m going to make a special case here, specifically due to the incredibly high ratio of brand recognition to actual product quality involved. To be clear, this is absolutely nothing like the Office you’re used to on your PC or Mac, and in fact I really consider it misleading to even use the name “Office” for an app like this. The iPhone version of Word has roughly the same level of functionality as what I remember being present in Wordpad back in the Windows 95 days. Someone I know at Microsoft has told me there’s an iPad version due out around a couple of months from now. I don’t know any more details, but I’d be very surprised if it provided the full functionality that’s available on the version for the Surface. 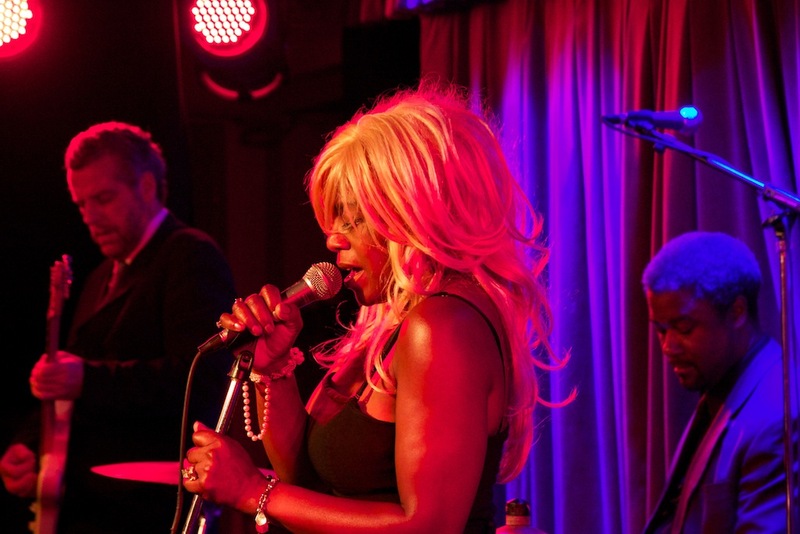 Would a visit to America still qualify as valid if it didn’t include attending at least one or two live blues performances? So I’ve just arrived in San Francisco for WWDC. This is my first time here, and in fact my first trip to the US, and I’m really excited about the conference. Primarily I’m here for networking – I see it as a great opportunity to meet with other developers and chat about our experiences and ideas. Learning from other developers about their experiences with marketing apps – what works, and what doesn’t. To be honest, the development part of this project has been the easiest aspect (a huge amount of work, but comparatively easy). The marketing part has been really hard. It’s an unfortunate fact of life that the success of technology products has more to do with marketing than their actual features or quality. I think this is something a lot of us struggle with, but I’m sure there’ll be plenty I can learn from the experiences of others. Finding other developers to collaborate on an open source file synchronization framework. This is one of the most time-consuming parts of developing a content creation app, particularly given that each different service such as Dropbox, Box, Google Drive etc. has a separate API, so you have to implement each individually. I’d like to put together a framework which takes care of all this stuff for you, so you can just plug it into your app and easily sync with all of these services. I’m sure there are many others who have struggled with this, and I think if we work together we can come up with something that benefits app developers, users, and storage services by abstracting away all the boring plumbing stuff. Identifying opportunities to have UX Write tie in with other apps that provide complementary functionality, as I’ve already been doing with Texpad and Box. I’m focusing specifically on word processing with UX Write, but there’s a number of other types of apps (such as drawing programs, mind-mapping tools, and outline editors) that I’d love to make UX Write work with. And finally, the sessions. These are actually last on my list because I’ve already got access to Apple’s excellent documentation and they are also making the videos available for developers who missed the two-minute registration window for the conference. 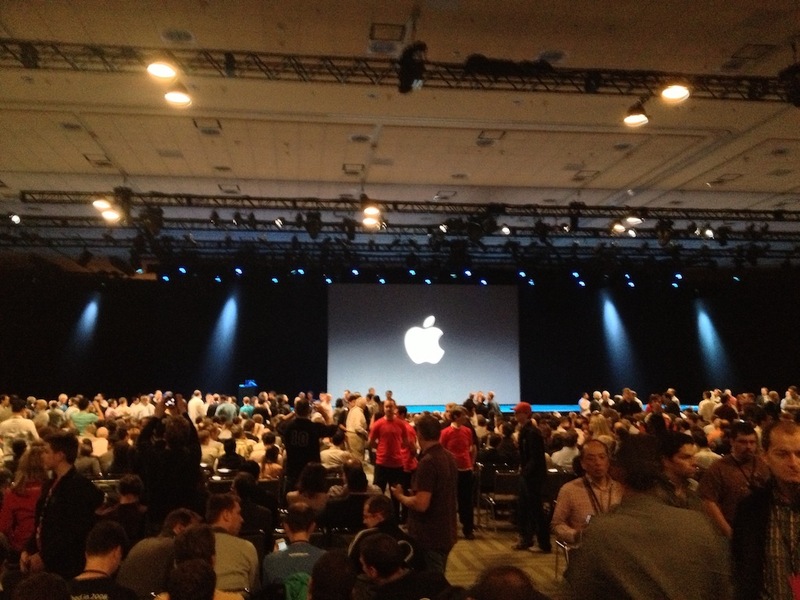 But it will nonetheless be good to hear directly from Apple engineers about advice on making the most of the platform. In particular, I’m keen to get a better understanding of localisation, as one of my main priorities right now is improving support for a wider range of languages in UX Write. Given the immense concentration of tech companies in the valley (far more than anywhere in Australia), it’s also a good opportunity to meet with other companies working in the area of mobile and online services, and I have several meetings lined up that I’m hopeful could lead to some useful collaborations in the future. Over the last couple of weeks I’ve been dealing with a very frustrating problem. I’ve become aware of three different instances in which unauthorised, repackaged copies of UX Write have been submitted to and approved for sale on the app store, each under a different name. I’ve been going through the standard process to pursue these cases, but decided to post here as well, to clarify that these copies are not legitimate versions. 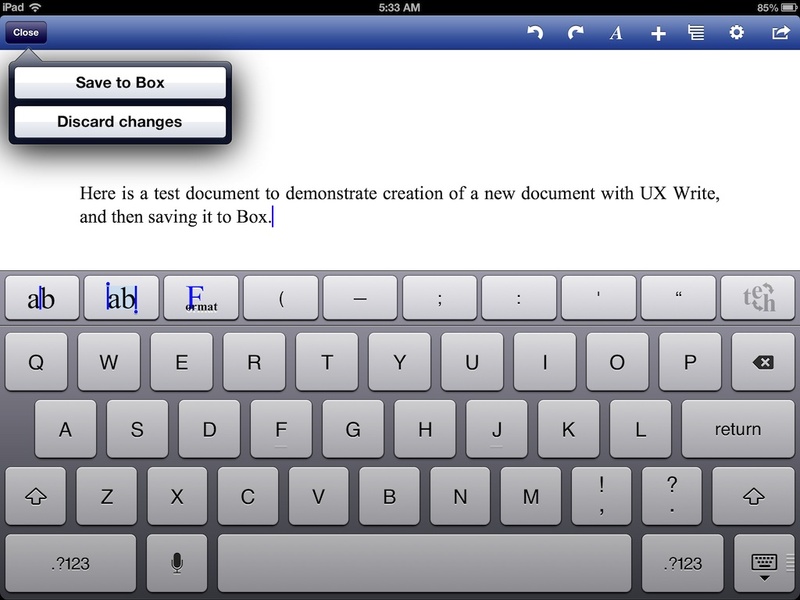 The genuine version of UX Write is available on the app store here. All three are verbatim copies of UX Write version 1.1.4, with only the name and icon changed. 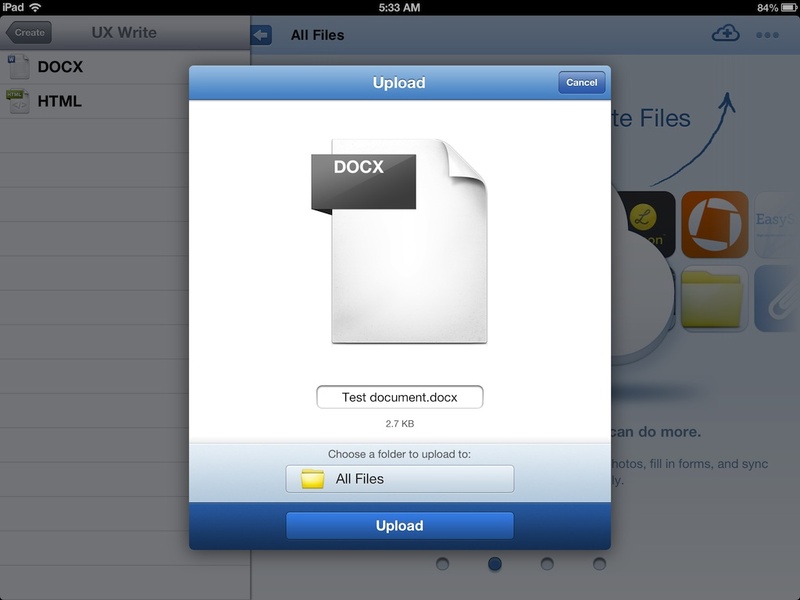 The Getting Started guide has been modified to use the name “Document Master”, even in the case of the last two apps. The screenshots on the app store are completely inaccurate and the descriptions highly misleading, in many cases listing features the app does not actually provide. The only reason I even became aware of these is because the people who did the repackaging made a certain mistake (the details of which I won’t go into) which results in the app crashing under certain circumstances, where the original does not. Since the actual program itself is unmodified, it still uses my email address as the destination for all user-submitted bug reports and feedback. I’ve received emails about these from more than 200 people so far, none of whom initially realised that what they’d purchased was an unauthorised copy. Piracy is a fact of life in the software industry and ultimately there’s nothing you can do to stop it. It would not surprise me one bit to see copies of UX Write on the Pirate Bay or other sites that have apps for downloading to jailbroken devices. But the app store is different – it’s run by Apple, who review every submission to ensure it complies with their rules, and once approved, they earn a 30% cut of every sale. So while I wouldn’t even bother spending time trying to deal with copies posted on torrent sites or similar, the nature of the app store is such that I think it’s reasonable to expect a higher standard from it. The last time something like this happened, Apple refused to do anything about it and told me I had to deal with it myself. I made it clear to them that I’m expecting a better answer this time, and the people I spoke to were very understanding and I’m hopeful they will eventually remove the apps. After all, telling developers such as myself to email the people selling pirated copies to ask if they’d please stop doing so is not, in my opinion, a viable solution. There’s nothing to stop the other party from ignoring emails, refusing to take their copies down, or simply doing so but then resubmitting with a new account and a different name. I don’t directly blame the reviewers for approving these copies in the first place – there are hundreds of thousands of apps out there and it must be huge task to manage it all. But the process is clearly broken, and needs to be fixed. I’m due to attend WWDC in a couple of weeks and hope to have the opportunity there to speak with people from Apple about the issue and how the situation could be improved. I’m far from the only developer affected by this problem – in checking for other copies of UX Write, I’ve found many other instances of apps from other companies being repackaged and approved as well; it’s clearly a widespread problem. Every now and then a “leak” comes out about a purported Microsoft roadmap saying that they’re planning a version of Office for iOS and Android, but it’s been delayed for one reason or another. This month is no exception, with a release slated for the second half of 2014 . I honestly don’t know if these rumours are actually true, or just a clever PR stunt on behalf of Microsoft to discourage others from trying to produce competing apps. What I am certain of however is that the task of porting the huge legacy codebase of Office to the iPad must be absolutely daunting. Office is an immensely complicated piece of software, and if they are working on an iOS version, I’m not surprised it’s taking a while. “Office is becoming irrelevant. The iPad has flourished despite not having MS Office and that’s an encouraging sign. The days of Microsoft software being a “must have” for success are over. I think there’s a great deal of truth in this. There’s a school of thought that considers MS Office as the be all and end all of productivity apps, and that every other piece of software must be measured by how closely it matches it. I disagree with that notion, and as nuckinfutz pointed out the most important thing is not whether you have MS Office per se, but whether you can actually get your work done and access your documents. UX Write fulfils this criteria. In fact I’m of the view that MS Word is a really bad starting point if you’re trying to create a tablet word processor. We’ve seen what they’ve managed to come up with on the tablet form factor so far, and it leaves a lot to be desired, to put it mildly. UX Write has been designed from the ground up with mobile devices in mind – catering for the small screen, adapting cursor movement and selection for the on-screen keyboard, and making it dramatically more intuitive to achieve consistent formatting throughout your document. This stuff is much easier to do if you’re starting from scratch. Sure, it takes a long time to get all the features people want and expect in, but that’s probably no less a task than porting a large codebase with lots of dependencies on Windows. So why wait for Microsoft? Give UX Write a try today (which you can now do for free in your browser), and check it out in the app store if what you’re looking for is a high-end word processor that works well with existing docx files created in Word.